We had read great things about the BREWS CRUISE in Asheville so it went right to the top of our to-do list while we were in town. We decided on the mobile cruise because we aimed for heavy consumption and didn’t feel like stumbling around from brewery to brewery. It wasn’t the most organized operation– our tour departed late and getting info via phone was spotty– but in the end, we had a great time. We met at the ASHEVILLE BREWING COMPANY and I highly recommend you order a slice (or two) before the tour begins. The pours at each brewery are quite generous and it helps to not have an empty stomach. Our first stop was HIGHLAND BREWING COMPANY, makers of H’s favorite Gaelic Ale. Luckily, we got plenty of Gaelic samples along with Highland’s Oatmeal Porter, St.Terese’s Pale Ale, Kashmir IPA and Black Mocha Stout. Our in-depth tour included information about the brewing process, hops and facility. The second stop was FRENCH BROAD BREWERY where we sampled the 13 Rebels ESB, Wee Heavy-er Scotch Ale, Gateway Kölsch, Rye Hopper and (seasonal) Zepptemberfest. The staff was super friendly and it was great to get a sense of what Asheville’s local brewery scene is really like; locals were in and out of the tasting room the whole time and French Broad’s got a stage for a regular calendar of live shows. 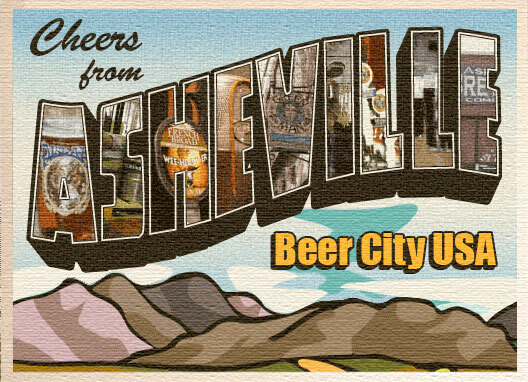 Our third stop was back at Asheville Brewing Company for our final brewery tour and sampling. We tried the Shiva, Ninja and Houdini. There may have been more but by this point in the tour we had all had so much to drink things were getting a wee bit blurry. All in all, each of the breweries was fantastic and all the staff members we met were extremely hospitable. Our tour guides were warm, enthusiastic and knowledgeable and the other tour guests were great. I had originally thought the $45 price point might be a bit steep but we walked away with plenty of info and a great buzz. Success!